helps keep the oil cooler, extending the life of the hydraulic system. feature on all Darby bending machines. Frame cross tubes supporting the hydraulic cylinders have 3/8" (9.5 mm) wall thickness. Parker Seal-Lok™ hydraulic system prevents leaks and has a working pressure rating of 3,000 psi (206.8 bar). Murphy control panel includes electric start, throttle control, oil pressure, tachometer and hour meter. 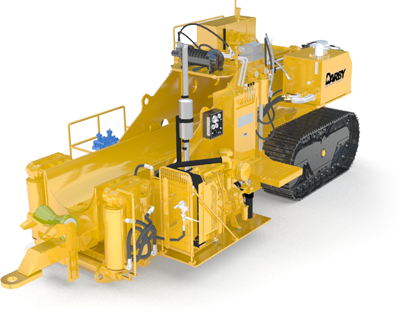 Hydraulic cylinders can be disassembled without cutting for ease of repair. Pinup is fully reinforced to prevent spreading. 390 Quincy Air compressor is hydraulically driven by its own circuit. 10-micron hydraulic pressure and return line filtration keeps oil clean to extend the life of the system. Oil cooler in compressor drive circuit keeps the circuit cooled. It continuously circulates, even when the compressor is not running. This extends the life of the hydraulic system. Maximum bending force at front of stiffback is 763,000 lbs (346,090 kg). Air compressor provides 240 psi (16.5 bar) continuous pressure for mandrel operation. With engine running at 2,200 rpm, hydraulic vane pump produces 74 GPM (280 LPM) @ operating pressure.